One of the many trees that grows over Ta Prohm temple. This temple had been left more or less as it was found, with an overgrowth of jungle and portions tumbled down, but restoration work funded by the government of India began in 2006. It gives you some idea of what the first westerners found when they began exploring the area in the late 19th century. This is a huge temple, one of the largest single complexes in the Angkor group. It's all on one level though, so there are (almost) no high stairways to climb, but there are a lot of thresholds to cross, so you do get a lot of exercise exploring this place. Ta Prohm is a place you should definitely plan on seeing, to give you some idea of what the other temples looked like before they were restored. The trouble is, it has become so popular - thanks to a certain hollywood movie - that it can be quite difficult to see anything at all, for the hordes of tourists. Ta Prohm was one of the first temples built by the great builder king Jayavarman VII. The construction date is set around 1186. The temple is dedicated to the king's mother, while the later Preah Khan was dedicated to his father. The plan is very similar to Preah Khan, with a huge labyrinthine inner sanctuary, a large courtyard just inside the eastern gateway, and even a two story building north of the courtyard similar to the one at Preah Khan, although without the distinctive round columns found in the example at the later site. Like most of the other temples built by Jayavarman VII, Ta Prohm was originally a Buddhist monastery, but later kings removed the Buddhist elements and altered the relief work to make it into a Hindu temple. 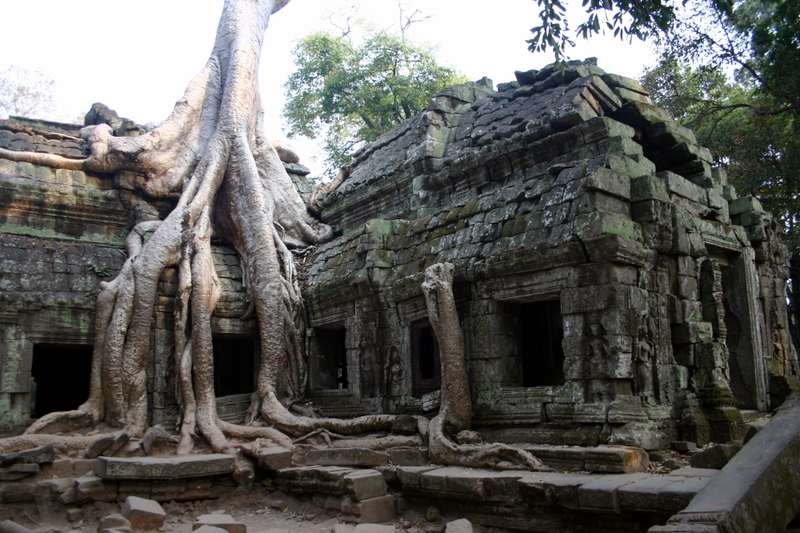 In its day, Ta Prohm was an extremely wealthy temple. It 'owned' more than 3,000 villages and took nearly 80,000 people to maintain the temple, including 18 high priests, 2,740 official, 2,000 assistants and 615 dancers. The temple's possessions included around 500 kilograms of gold dishes, dozens of diamonds, and thousands of pearls and precious stones. Enter the temple through the east gate. The long white sandy path between the outer gate and the inner sanctuary is courtesy of the film Tomb Raider. At the end of the trail is a typical ceremonial terrace in front of the large eastern gateway to the inner sanctuary. Past the grand gateway is a large court with galleries. Behind the court is another wall enclosing the central sanctuary. Passing through this wall brings you to the crowded courtyard with the walled central sanctuary in the center. At this point, I suggest you veer to the left, making your way around the southern wall of the central sanctuary, between it and a large enclosed annex built along the southern outer wall. This will bring you to the southwest corner of the courtyard. From here there is a good view of several large trees growing on the wall of the central sanctuary. There's even a mound of earth and stones near the outer wall that makes a good elevated spot to take a picture. Next, make your way through the west gate into the inner sanctuary. All around the central sanctuary, there are several more fantastic tree-in-temple shots. Exit the inner sanctuary by the east gate, putting you back behind the galleried court. Veer left to walk around the north side of the inner sanctuary, back towards the west side, where there are several more interesting trees and sculptures. Finally, exit the Ta Prohm complex by the west gate. The best time to visit Ta Prohm is in the afternoon, when the light falls best in the southwest courtyard.